Our company owns a series of utility patents, and this is one intellectual property that we want to sell off. We realize that this is a good business oppurtunity, but unfortunately we cannot make good use of it, due to our limited capacity and the location of our company. Our design concept for PC panel is much simpler than the drivebay concept featured in our website, and this is an advantage as it does not require additional cost in the PC production. For technical details of FRONTX PC Panel, please email Matthew Goh. 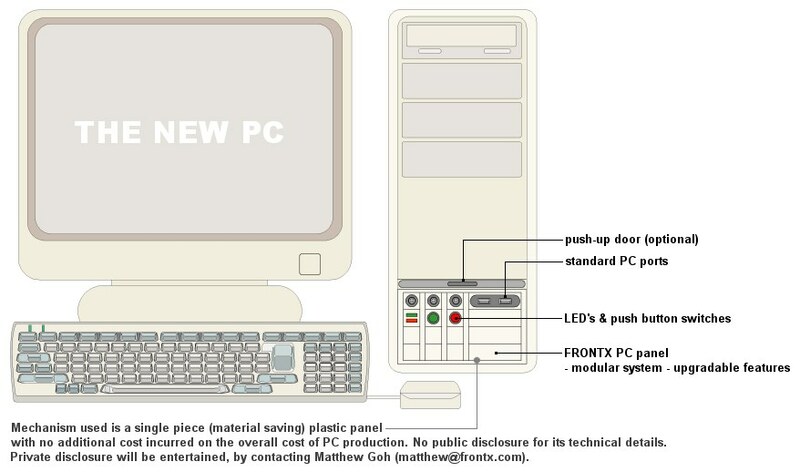 The original platform of PC / computer was designed to allow versatility for upgrading, i.e. hardware cards and peripherals can be added and removed easily. However, this platform has not changed much, and now, it is too "rigid" (not versatile enough) to handle the sophistication of present technology. In view of the current stage of PC development, we believe that the new PC should be made more versatile. Innovation and its monopoly rights are the key elements to business success. We must design products to please our consumers, as to succeed is to make them quickly decide; "this is the product and this is the brand I will buy". This is one good oppurtunity to increase your market share and to boost investors' confidence in your company. If you believe in our vision and is interested to acquire / purchase the above utility patent, please do not hesitate to contact us.